the congregation recognizes that doing church the same way is not working and is looking for a new way to move forward together into the future. the congregation wants to find new energy, purpose and direction using God’s Word, prayer, conversation and faith practices. the congregation is ready to link the gifts that God has given it with God’s vision for the world. the congregation is interested in identifying new ways the congregation can connect with its neighborhood and community. the congregation wishes to learn how to navigate change calmly, confidently and effectively. the congregation is willing to engage in four weekend workshops during a two-year long process that will equip, support and encourage renewal and growth in the congregation. The process includes identifying and sending a congregational team of between four and seven laypeople plus a pastor to four weekend training events spread over the course of two years (every six months). The entire congregation is asked to bless and buy into the process, working with the team on developing and implementing renewal goals in between trainings. 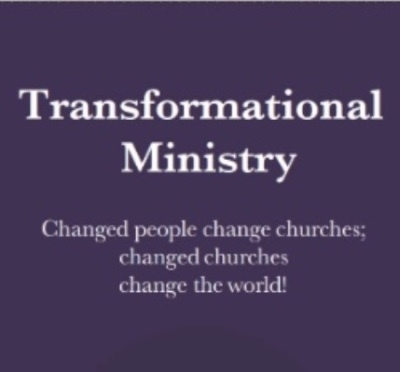 The main goals of Transformational Ministry are to connect your congregation more deeply to God, to each other, and to the world outside your doors. A congregational team will be accompanied by a coach to help you achieve individualized goals, equipping you with tools along the way. With the brochure available for download below, your congregation can learn more about Transformational Ministry and explore the congregation’s readiness to embark on this adventure. Please contact Pastors Rich and Rebecca Sheridan, Nebraska Synod Evangelists at evangelism@nebraskasynod.org, if you are considering registering and would like more information about how to engage in the process. Parts 1 and 2: July 20, 2019 (click here for registration).